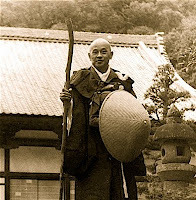 More thoughts from “Zen Is Right Here,” stories of Shunryu Suzuki Roshi – a selection that represents some of the things I’m struggling with at the moment. “Will go away,” we were sure he was going to say. “…will continue for the rest of your life,” he concluded. The way he said it, we all laughed. During a lecture, Suzuki Roshi had said that life was impossible. “If it’s impossible, how can we do it?” a student asked. “You do it every day,” Suzuki answered. For today, I have nothing to add.